If you remember our post from a couple years ago about moving a mummy, you know one of our specialties include moving delicate, seemingly priceless items. 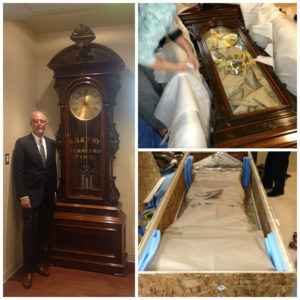 This was put to the test for one of our corporate relocation clients, Patriot Rail, who wanted to move a 130-year-old grandfather clock from Anaconda, Montana to its headquarters in Jacksonville, Florida. And this is not your run-of-the-mill grandfather clock. Aside from being more than a century old, it’s only one of five in existence, valued by a Swiss expert at between $350,000 and $500,000 and still keeps perfect time. You could say we had our work cut out for us. This move highlighted so many of the skills and services we frequently discuss with our clients – handling the selection of specialty vendors to assist with the move, custom building crates for shipment, and the unusual problem solving that can happen with any move. For such a large, precise object, we needed to build a custom shipping crate on-site, which took almost an entire day. Loading it also proved challenging for several reasons. First, it’s common for antique grandfather clocks to have mercury pendulums to function. Because mercury is such a hazardous substance, we needed to use a separate exclusive-use truck to ship it. Second, in addition to the mercury, we also needed to remove the rest of the clock’s inner workings to protect them and the body of the clock, which required the assistance of a professional clock company that we had hired for the move. The challenge though didn’t stop once we got the clock off our truck and into Patriot Rail’s headquarters. The plan was to display it on the third floor outside of the president’s office. Unfortunately neither the stairwell nor elevator was big enough to fit the 12-foot clock. Undeterred, our crew surgically removed the head of the grandfather clock and reassembled it once everything was on the third floor – which also required Patriot Rail to raise the ceiling by several feet to accommodate its office’s new crown jewel. When all was said and done, it was exciting to see such an impressive display of craftsmanship in its new home.